Internet Security or Online Security has become very much important now-a-days, because in today’s lifestyle everyone of us relies on the internet for our day to day activities be it online shopping or transactions, Communication with friends or family, Financial Services, Entertainment and many other activities. But with the growth in the use of internet the risk of the leakage of your important information or data also increases. As typical internet users, we have a reasonable trust in our hearts that whatever we are sharing over the internet is secure, safe and private i.e. photographs, videos, messages, etc. same in the case of online transactions. Whenever we are making a purchase using our debit or credit card we will never want that anybody else can get the access of our card details. That is why making secure and safe internet experience for the users has been become the most important component. For providing a more secure and safer online experience to its users Google comes up with some unique ways. In the following article we are going to discuss about the security protocols and security certificates i.e. https (hyper text transport protocol secure) and SSL (Secure Socket Layers). 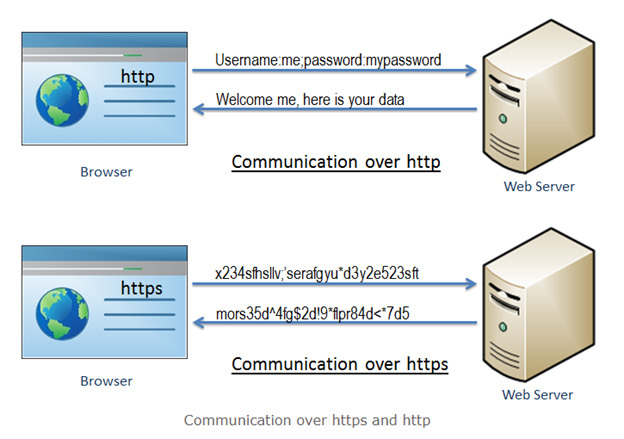 In the Following image we have given the information related difference between Http and Https. By going through this image you can easily understand the difference. Here we have enlisted some icons and their meanings in the above screenshot, which you can see while going through many websites on the internet. HTTPs stands for hypertext transfer protocol secure which is a variant of the standard web transfer protocol HTTP. HTTPs add a layer of security on the data while transferring it through SSL or TLS connection. It is encrypted in order to increase security of data while transferring it between two users. HTTPs, basically is a internet communication protocol which is used to keep any kind of data i.e. passwords, messages and card details safe and secure. HTTPs encrypts the data packet in transition using some encryption techniques (SSL or TLS), which makes the transited data safe by avoiding the intermediary hackers or attackers to extract the content of data, even in the conditions of connection compromises. You can see understand the difference between HTTP and HTTPs in the following image. This method ensures a secure communication between a user’s browser and web server. It is basically indicated by a green address bar or by a padlock in the browser window. In the modern web browsers the websites which are not using HTTPs are marked differently in comparison of the websites which are using it, as you can see in the following snapshot. Traditionally https was used by the Ecommerce retailers or other people accepting online payments, so that to securely sent the payment details and to prevent the details being stolen by some malicious hackers. But in recent years improving internet security has become more important and Google also came up in the forefront in this drive, by announcing it as a ranking factor for the websites which made more website to switch to HTTPs. Therefore, Google strongly recommends having HTTPs for any business having a desire to reassure its visitors to their website. It will provide security to their website and will help them to rank on the result pages of Google. According to a study held by smerush.com, having HTTPs for your websites is the no.10th factor in the main 17 ranking factors on Google. And also 65% of all the domains which are ranking higher on Google for high volume keywords are ones having HTTPs. Jeewangarg.com as one of the best Website Designing Company in Delhi, know the value of having secure websites. That is why we always suggest our clients who wish to create a new website, to definitely go with HTTPs. HTTPs, is based on one of these encryption techniques: either on SSL (Secure Socket Layer) or on TLS (Transport Layer Security) for the encryption of data. Many Website use SSL encryption technique, we will later on discuss about SSL in the same article. Both these encryption techniques use an Assymetric Public Key Infrastructure, where a “public key” and a “private key” are used to encrypt the data. The private key is stored on the web server and public key is stored in public domain which is used to decrypt the encrypted data sent from the servers and sometimes vice versa. Browser initiates an HTTPS session with the server, then the web server sends the public key to the browser and an SSL Handshake is then performed between the browser and the server. Once the secure connection is initiated and accepted, the browser recognizes the secure link and shows the link as secure with a padlock or green browser bar, depending on the type of SSL certificate you are using. 1. Secure Communication: HTTPs makes a secure connection because it establishes an encrypted link between the server and the browser. 2. More Trust: HTTPs reassures the customers of a business that they are dealing with a secure and responsible business. 3. Data Integrity: In case if hackers manage to steal the data then also they will not be able to read or modify it. This is called data integrity and HTTPs provides it to the users. 4. Improved Conversion Rates: If the potential customers feel secure while dealing with you than the conversion rate will definitely increase. 5. Privacy & Security: Hackers can only passively listen the communication between the browser and the web server in case you are using HTTPs, so obviously the privacy and security is maximum with HTTPs. 6. Faster Performance: HTTPs takes less time to transfer the data in comparison of HTTP because while encryption it reduces the size of data. 7. More Traffic: As Google has already stated HTTPs as the ranking factor, so in SEO your site will rank higher if you are using HTTPs, which will end up having more traffic towards your website. Is it Compulsory to Switch to HTTPs over HTTP? 1. If you are thinking to switch to HTTPs just to serve your SEO purposes, then you have not much need to switch as `HTTPs solely can’t serve your SEO or Higher Ranking Needs. For the SEO Needs of your website and proper implemetation of HTTPs you can hire Best SEO Company in Delhi, India. 2. But if you are setting up a new website it is good to have HTTPs in place from the day1. 3. If switching to HTTPs makes an economic sense for your business, then it is better to consider a switch. 4. If you are just a blog owner and asks for the email ids of your customers but nothing else, then it is better not to switch as you have a limited budget and you better spend it somewhere else. 5. You can also make a selective switch for some of your website’s pages wherever you ask for some sensitive information from your customers i.e. card details etc. SSL Stands for Secure Socket Layer Which is, a standard security protocol used to establishing encrypted links in an online communication between a browser and a web server. The usage of this technique ensures that the data which is transmitted between two mediums remain secure and encrypted. For an SSL connection there is a requirement of SSL certificate and for getting SSL certificate you need to fulfill some criteria i.e. you need to give all details about the identity of your website and company as and when you want to activate SSL on your web server. After that 2 cryptography keys will be generated i.e. a public key and a private key. Further the submission of the CSR (Certificate Signing Request) is performed, that is a general data file that contains your details and your Public Key. Your details then would be validated by the CA (Certification Authority). Once the authentication of all details is successful, you will be issued an SSL certificate. The newly-issued SSL would then be matched to your Private Key and from this point onwards, your web server will establish an encrypted link between your website and the customer's web browser. The presence of an SSL protocol and an encrypted session is indicated by the lock icon present in the address bar. When you click on the lock icon it will display details about your SSL to a user/customer. SSL Certificates are issued to either companies or legally accountable individuals and that too only after proper authentication. Your domain name, the name of your company and other things like your address, your city, your state and your country all these details are comprised in an SSL certificate. It also shows details of the issuing CA as well as the expiration date of the SSL. Whenever a browser initiates a connection with a website which is SSL Secured, then it will first retrieve the site's SSL Certificate and check if it's still valid or not. It will be also verified that the CA that SSL certificate have is one that the browser trusts or not, and also that the certificate is being used by the website for which it has been issued or some other website. If any of these checks fails, a warning will be displayed to the user, indicating that the website is not secured by a valid SSL certificate. 1. Data Protection: The main function of an SSL certificate is to protect the communication between the server & the client. When you install SSL, it encrypts every bit of the information. In simple language we can say that, the data is locked and only intended recipient can unlock it (browser or server) because anyone else can’t have the key to open it. While dealing with sensitive data, SSL helps you protect against the troublesome hackers and skimmers. As the data is converted into non readable format by SSL and hacker’s skills prove to be just wastage against the paramount encryption technology of SSL certificates. 2. Better Ranking on SERPs: The websites having SSL certificates are rewarded with better ranking on SERPs by Google. As Google in 2014, changed its algorithm and announced having SSL certificate a primary factor for gaining higher ranking. Having an SSL certificate for the website along with hiring Best SEO Services in Faridabad will make your website rank higher on SERPs. 3. SSL Affirms your Identity: The next important task of an SSL certificate is to provide authentication to a website. Identity verification is one of the most important aspects in case of web security. Such verification makes sure that no imposter or hacker creates a fake website pretending it is yours, technically termed as Phishing. Thus, SSL helps the users drive to your original website, saves users from frauds that enhances your reputation. 4. SSL is the primary requirement for PCI/DSS: When you accept online payments then it is necessary that your website is PCI Compliant and being SSL certified is one of the primary 12 requirements of PCI industry (payment card industry). So you want it or not it becomes necessary for you to make your website SSL certified. The following is the code which a developer need to implement on the website for redirecting your website from HTTP to HTTPs one. Please have a look at that. Here we are talking about the link of a tool which is used for checking if HTTPs is working properly or not on your website. In addition, it will also let you know if your website is having a mixed content. Mixed content occurs when initial HTML is being loaded on HTTPs and other resources like videos, images and sheets are loaded on HTTP. This is called mixed content because both HTTP and HTTPs content are loaded on the same page. But mixed content can adversely affect your website. ● If your page is not secure then the browser will show different kind of threats e.g. page is not secure, to you visitors. Which will make your webpage look unprofessional and your visitors are less likely to trust your website. ● If a visitor will not be able to trust your website then it will adversely affect your business because visitors will feel hesitant to make a purchase from a unsecure website. ● The WebPages that are not secure will show you many kinds of threats and it can also change the look of your website and even what it sells. And it can indirectly affect your SEO in case someone has injected bad links on your website. A website with both the secure HTML and web content is shown like below. But a Website with some secure and some unsecure content is being like following image i.e. it will show the website in a not secure form. The following link will help you to find out the pages having mixed content so that you can find it and fix the issue. Would you feel safe if your browser warned you about a website being “not secure”? No, you will not go further on that website. 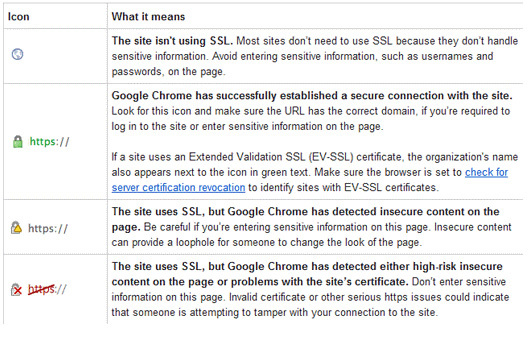 But that’s what will be shown in Chrome for your website if you don’t have an SSL certificate. And being a Business owner or so you will never want this to happen with you website. So go ahead and buy SSL certificate and make your website secure by adding an unconquerable layer of protection to your website.